One year of wearing the same things is a great way to see how well your clothing is made. As to be expected, there have been some casualties. Working through on category by category basis I have assessed the damage a year of wear has caused and throughout the week will be looking for ways to repair, recycle, rethink or replace these items. It seems a little narcissistic to be sharing such a personal process with you, but I am sure someone out there somewhere may be able to take home and adapt some of the information to assist them in their daily life. My categories are shown above. As you may notice it looks like I ideally spend all my time at the gym. While this may or may not be true (I’m so buff *not* he he he) my gym clothes are washed more regularly than anything else in my closet so I require more of them than other items. If you are interested in this lifestyle analysis process click here for instructions on how it all works and you too can start to prioritise your shopping wants and needs. Starting off with my most dire category. Lets talk gym wear and then work through the rest. 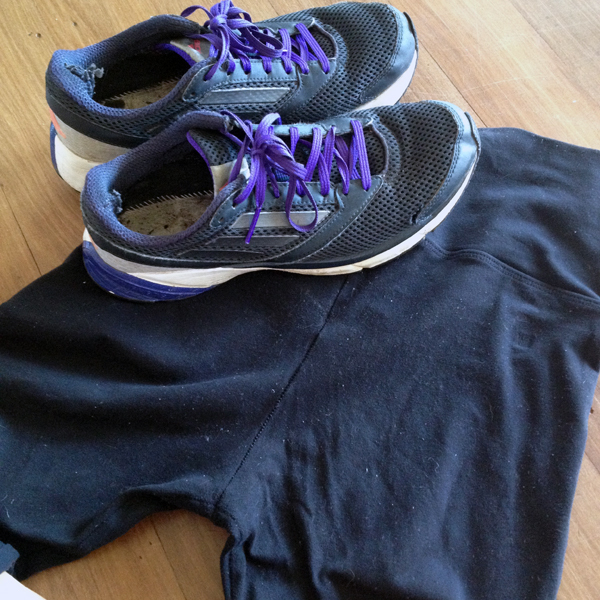 Owning just two pairs of quite-well-worn gym leggings made for an interesting challenge from the beginning of the year. The picture above (with the sneakers) sort of illustrates how close they are to having a bit of a seam blow out. Both pairs look the same, with one being slightly more opaque than the others. Unfortunately for these guys the only option is replacement. This doesn’t mean that they won’t be worn. They will be downgraded from ‘gym appropriate’ to dog walking (which is all categorised under ‘gym’). Dog walking is less bendy than gym or yoga so they will survive another year that way! The (one and only) sneakers have developed quite a good hole in them so they will need replacement in the near future. Unfortunately sneakers are one of those things that need replacing often as they wear out pretty quickly. Again, like the leggings they will get another year or so worth of wear as shoes I can use in the plant nursery when its too hot for work boots, or used for dusty walking tracks, of which there are many around my area. As far as sports bras go I can safely say they are covered. Years and years of working as a lingerie buyer/ manager means I am well stocked for all things underwear. Tops are patchy. These will have to be reassessed after some new leggings are purchased. 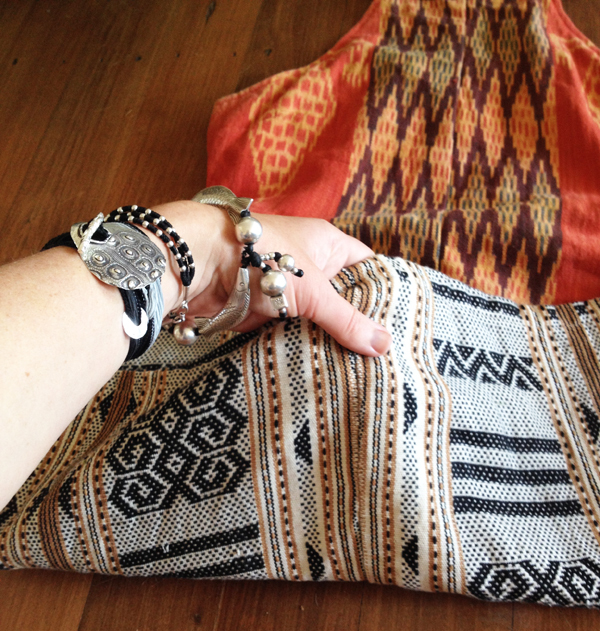 Sometimes the addition of something new can breathe life back into the older parts of your closet. I have a few black sports tanks that rarely get used due to all my pants being black (I can’t do black on black at the gym, don’t know why). Once I get some printed or coloured pants they might all look brand new and totally wearable! My two long sleeve light weight tops are nearly worn through (one is more than ten years old), and my hoodie is looking ok, but that because I don’t find it comfortable so it never gets worn. This may need to be donated or sold and a replacement purchased. No point in it sitting around my closet not doing anything! I have lumped these categories together because they are boring. My field work gear is all good. My two sets of all navy blue workwear are in perfect condition, the only problem with them is that they are navy blue! This means they can be VERY HOT in the field. So I will be on the look out for some lighter colour workwear while thrifting (all these navy ones were found brand new at a thrift store for a grand total of eight dollars) so I can mix and match. No hurry for these but they are definitely on the radar. Having already purchased more ‘work’ tops (such a boring first purchase) I am at my ideal quota of four. This makes for easy rotation and washing. Like the field work clothing I will be on the look out at thrift stores for new shorts, as I own two pairs but would like four. Pretty much everything in this category looks the same as it did twelve months ago. It does get worn frequently but is rarely washed. Most dinner outings are fairly quiet affairs and don’t result in dirty clothing (unless a food fight breaks out), going out can sometimes be fairly warm and sweaty, but usually only requires a wash of tops. The only ‘going out’ item that looks like it needs repairs is the dress above. It is MY ALL TIME FAVOURITE (and the one I based my wedding dress on…sssshhhh) and after a few parties it needs a little bit of love and attention on the seams. It goes to show how much dancing has been done in that number! My ‘lounging wear’ was mostly courtesy of one of the clothing stores I worked for in my year back in casual retail. The quality of all these items is HORRENDOUS but as they rarely get a serious thrashing they are all in as good a condition as when they were purchased. Which doesn’t say much as many of the items had to be sewn together before they were even worn due to bad machining. There are a few items that transition between casual day wear and lounging so they are looking pretty average. 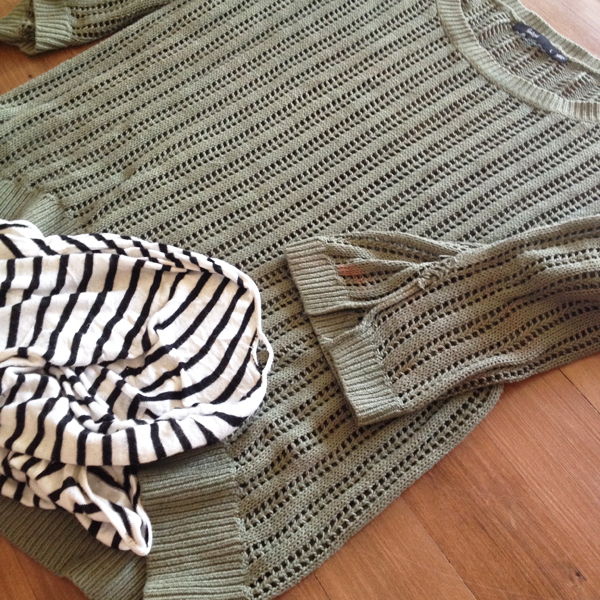 The stripy cardigan and green sweater above are both showing signs of wear but should be easily repaired. Both were thrifted items years ago so i have no idea how old they were in the first place. This area is all very happy. You can tell why by looking at the pie charts above. It is hard to wear things out when your supply is greater than your demand! At the beginning of the year this ‘casual daytime’ pie slice would have been an even larger! As the year has progressed things have slowly been moved out and into storage. This means that I have a quite a substantial amount of unwanted items to go to good homes. It is sad to visually quantify how much of my wages were invested in ‘keeping in line with store policy’ while working fast fashion. Those boxes of unwanted items not only represent my lost money, they are carbon miles, corporate greed, the time invested by manufacturers and machinists, spent resources, and environmental degradation. What has faired worst from this category is my basic tees and tanks. This is because they get rotated and washed so frequently. Like gym wear, basic tanks aren’t as prevalent in my closet as other items. This is because they aren’t easy to find while thrifting and the stores I worked for wanted staff in fashion items, not basics. So the four that I have (one black tee, one grey tee, one grey tank, one black tank) are used daily, and living in a hot climate get washed weekly. Pretty much everything else in my closet (gym wear and field/work wear excluded) isn’t washed unless it is visibly dirty or smells bad. I would take a photo of the tanks and tees and show you, with pride, the holes in them, but unfortunately they are all on the clothes line. There you have it. Clothing can last a year even if it was bought from a ‘high street’ chain store. The most important factors to consider when planning your closet is how often you will wash and wear items. Reflecting on each category above, it isn’t about how often you wear things or what you are wearing them for, washing is what really causes items to disintegrate quickly! I have learn from this experience that I am more than catered for when it comes to the ‘pretty’ stuff, what I really need to focus on is keeping on-top of my basics. After all that I must admit I haven’t had a chance to assess the shoe situation. Shoes are hard work! Every occasion calls for a slightly different pair! I know there are some in my closet that haven’t had one outing this year! It might be something to look at when I have made my way through this week of clothing analysis. Sorry if this really was an uninteresting over share! Hopefully there is some take home message or strategy. If you have made it to the end of this post I will safely say my ‘take home’ message from this whole thing is that washing clothing really is the easiest way to wear it out! The more you can refrain from washing, the longer things will last. If you decide to do a lifestyle analysis on your closet I would love to hear any reflections you have on your ‘supply vs demand’. Please feel free to share below. Love love love this post! I’m on night shift this week so am spending day 1 (today) washing, sorting and donating clothes! 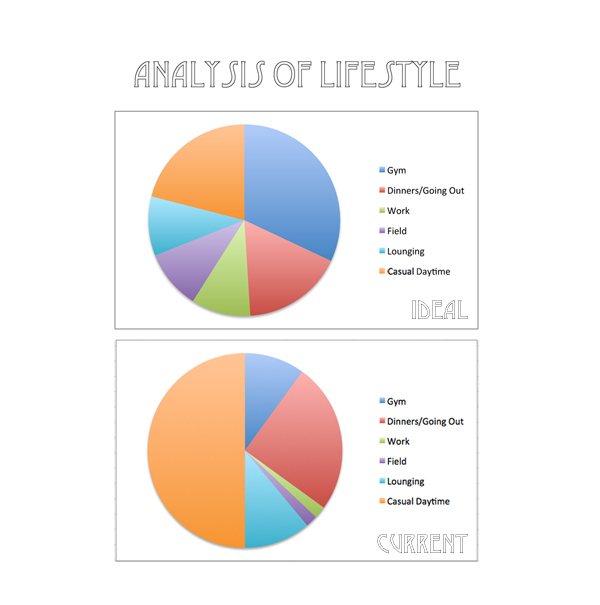 the pie charts are amazing and I am going to be taking an inventory of my life vs clothes…. As for your comment about owning shoes that haven’t seen daylight for a year…. I’m guilty of that! i have some heels that haven’t been worn for twice that (if not longer!) but shoes are my guilty guilty love…. I have put a ban on buying any more heels though as they just don’t fit in my life! How much fun is it to own heels that you never get to wear! He he he. Each pair is like a work of art that skilfully makes you look taller and prettier in an instant. The sad part is they also cripple you in under an hour. I will join you on the heel ban. Living on the Sunshine Coast there is rarely a heels-appropriate occasion anyway. I wish I could come and help you with the clothing clear out. We could have a SATC moment and drink bubbly while deciding on the ‘keep’ items. Completing that inventory was a revelation. Seeing my sartorial life laid out in graph format really honed in on the areas of my closet that are severing lacking. In addition to highlighting the fact I probably don’t need to add another boho vest or fringed tee in my closet for many years to come! Hope that you have a productive and cleansing day and thanks for taking the time to comment.